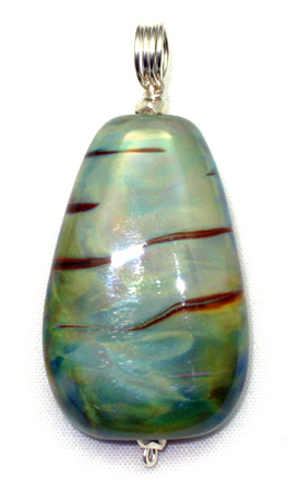 This flat teardrop shaped pendant bead has an opal yellow base almost completely covered with a single high silver content glass. As the final step in making the bead different torch settings were used to bring out both a silver sheen and the color variation from top to bottom. Turn this bead in the light for glimpses of green, blue, and pink reflections.